UPDATE 8/4/16: Jane’s new book Three Blonde Mice has just been published! 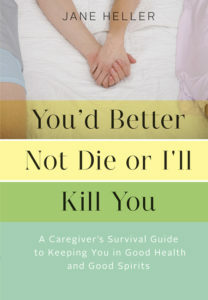 Popular author Jane Heller has taken a slight detour from her romantic novels to bring us a new caregiver’s survival guide called You Better Not Die or I’ll Kill You. 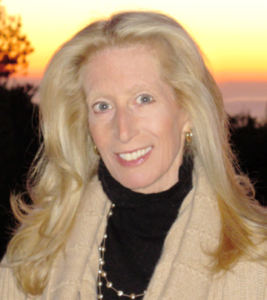 Jane started out as a publicist representing authors. Now, thirteen very humorous romance books later, she is an acclaimed writer herself. After reading her guide, I am amazed at how she has kept her sense of humor while being her husband’s caregiver for many years. STACEY: Were there a lot of rejected titles because this was a really good one? JANE: No. Actually this is the first thing that popped into my mind because I wanted to set the tone that this is not going to be a Debbie Downer book. But, also, it is literally what I say to my husband, Michael, every time he goes into surgery. When they’d wheel him up on the gurney to the double doors for the operating room, there he’d be and the nurse would say this is where you have to say your good-byes. And I would lean down and wag my finger and say you better not die or I’ll kill you. And he would laugh and off he’d go. I always thought that was better—sending him off with a smile—than having him see me all weepy and nervous. So that became the title for the book. STACEY: It really works well because it takes a bit of the edge and the stress off. It’s that little moment of levity that puts everybody at ease. JANE: I think humor helps, period. I think it certainly keeps me balanced. There are situations that are not funny, and I, in no way, want to be trivializing or dismissive of what caregivers go through. But I think there are times when we have to step back and say, you know, this is absurd and if I can’t laugh at it, well, then I’m sunk. STACEY: It’s probably what’s gotten you through this for so many years, too. If it was all doom and gloom for the whole time, your health could really have been negatively affected. You might not have stayed in there for the long haul. JANE: That’s right. We caregivers do have to take care of ourselves. So many of us neglect our own health because we feel that it’s self-indulgent to take time away from caring for our loved one. That couldn’t be further from the truth because if we can’t be healthy enough to do it, who’s going to? STACEY: This is your 15th book. You are your best promotional expert because this is how you started out, promoting other authors—people like Erica Jong. Being an author wasn’t something you ever thought was going to be your destiny, right? JANE: This is true. In fact, I was raised by a mother who cared for two sick husbands. My father died of cancer when I was six, and then she married my stepfather who ended up dying of complications from epilepsy. I said to myself some people marry for money and some people marry for looks; I’m going to marry for health. I’ve seen too many men drop dead in my life, and I’m going to marry a man without a medical flaw. Well, the joke is on me. There is no such thing. We are thrust into the role because nobody knows what the future holds so I became one of the 65 million or so caregivers. We say the vows in sickness and in health when we stand there at the altar. I don’t know that in the throes of passion anybody pays a whole lot of attention to that part of the vow. STACEY: So many of your books are romance novels with the Jane Heller lighthearted flare. But this book, while it’s a nonfiction guide, is a romantic story because it’s the story about you and your husband. Underneath all of it, is this really a love story? JANE: You have to really love somebody to go through some of the things we have. 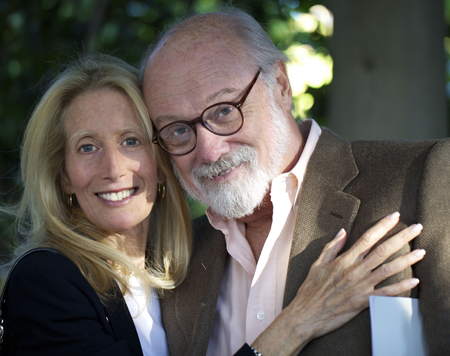 We just celebrated our 20th anniversary, and it’s been a bumpy ride! When you’re talking about spousal caregiving, it really is important to make sure that the person you’re caring for doesn’t feel like a burden. I write about the power of touch and how important it is to touch the person that you’re caring for so they don’t feel like a burden. I interviewed a critical care nurse in our hospital here, and she said that some people come and visit their loved one in the hospital and they sit in that visitors chair and read the newspaper. They forget to get up and give the person the massage or hold their hand or just touch them. STACEY: Your husband has Crohn’s disease. How has that affected your life? JANE: Crohn’s is an autoimmune disease. It affects the digestive system. In the same way that arthritis or lupus attacks the joints, Crohn’s hits you right in the gut. Michael was diagnosed at age 11, and he had many surgeries because the intestines become inflamed. It’s a chronic illness, so it’s never going to go away. It has to be managed with different medications, some of which cause their own problems which create personality changes and a lot of things I talk about in the book. But when I met him he was in remission so he fooled me. When he mentioned that he had something called Crohn’s disease, I said, well, what’s that? I never heard of it. He said it’s just a thing and don’t worry because I’m fine right now. Then shortly before we were getting married, he had his first trip to the ER, and I thought this is not a big deal and nearly a hundred hospitalizations later, here we are. STACEY: Unbelievable! This is something I went through when my dad was dealing with cancer; I wish that I had this book with me. There are so many things people are not going to know about until they get to that point. JANE: Right. I wanted to tell people if you’re feeling this, it’s normal. I think that we all need to feel that we’re not alone, and so I just wanted to have chapters that said things like crying is not a bad thing in small doses; it’s important to eat a meal; you’re not being self-indulgent if you actually take time away; and go out with a friend and enjoy yourself. I think we all need to have certain guides to lead us. We don’t have a manual for raising kids or elderly parents or for being a caregiver. So that’s what I wanted this book to do. STACEY: I think another thing that’s really important—and this is something I told my mom as she was going through it with my dad—is that while you’re caring for someone else, do not neglect yourself. This was something that you didn’t talk about until writing this book. Is this your big coming out? JANE: I would say that. I did neglect my health because I said how can I take time to go to the doctor. I’ll just wait. So you end up putting off things and that’s not a good thing. You don’t sleep; you don’t eat. In 2010, Michael was in the hospital four times having had two surgeries. I don’t think I took a breath that whole time. It was a rough year. I suffered the consequences. A big message to people is don’t neglect your own health. Even if it feels like not the right thing to do, you need to do it. STACEY: It was very important for you to not only share your own story but also to interview other people who are caregivers and also professionals in this field. How did you come about getting someone like actress Linda Dano, actor Victor Garber and others to be in your book? JANE: Once you put the word out that you’re looking for people who have gone through the caregiving experience, it’s quite easy. I wanted to cover the spectrum whether it’s someone dealing with, as Linda and Victor did, Alzheimer’s; or Harriet Brown who talks about her daughter’s battle with anorexia; or Yudi Bennett who talks about her son who’s autistic. Whatever the circumstance, even though the specifics are different, we all go through the same emotional experiences and I wanted to make that point. I wanted to have my round table of caregivers share issues like how did they got sleep when they had trouble sleeping; how they dealt with doctors; how they exercised. I wanted to know whether spiritual care important to them. I didn’t want it to just be my story. I wanted to throw it out for all to contribute. Then I wanted to seek out experts in a variety of fields—from a dietitian to a therapist, a meditation teacher and a cookbook author—with recipes for those of us who say who has time to cook. STACEY: Yes, you’ve got recipes and exercises in this book as well. You’ve covered every ounce of what it means to be a caregiver. How does your husband feel about all of this? He read it and there were a couple of things that he didn’t feel great about. Then he said if it’ll help somebody else, leave them in. He’s definitely a keeper. STACEY: An important thing you talk about, too, is caregiver burnout. How do you deal with that? JANE: Make sure that you exercise and take time away. I talk about creating a mental vacation. If you can’t get away, hop on a plane and do all that stuff that way. My escape of choice happens to be the Food Network. I can turn that on and watch any of those chefs cooking and I forget everything. We all have our escapes and I think we need them. STACEY: Is it important for caregivers to have a list of silver linings? JANE: Yes, because we can get very dark and think very low. It’s important to always try to literally make a list and ask yourself what are the bonuses that I have that I didn’t know I would have? STACEY: Jane, I have to thank you so much for writing (and I want to include the whole title here) You Better Not Die or I’ll Kill You–A Caregiver’s Survival Guide to Keeping You in Good Health and Good Spirits. It’s a very helpful book for anybody who needs it and there are certainly a lot of us who do. I hope you’ll talk to us again when your next romance novel comes out. Thanks so much for that great interview, Stacey. I really enjoyed our conversation, and I hope it helps anybody going through the caregiving experience. I also hope caregivers will take 10 minutes to try Christine Gordon’s relaxation for caregivers video. It’s saved me on many a rough day. Take care. Great interview! And, I have to say that Jane Heller’s book is terrific! I have given it as a gift to some friends who are now going to be caregivers, even one who is not, and they have loved it! Jane’s caring and wisdom are wonderful!